BOLS recently published an editorial placing the average cost for a 1850 pt 40K army between $600 and $750 before taxes or discounts. Ancients gaming can do one better than that! For comparison, I will use a 2 division army from Hail Caesar which is roughly similar to a 2000 point WAB army. This army will have 2 units of cavalry, 4 units of infantry and 2 units of skirmishers which totals 20 cavalry figures and roughly 125 infantry figures. Most metal historical figures will need to be equipped with a wooden base (11 cents from Litko) and a wire spear (20 cents from Northstar). 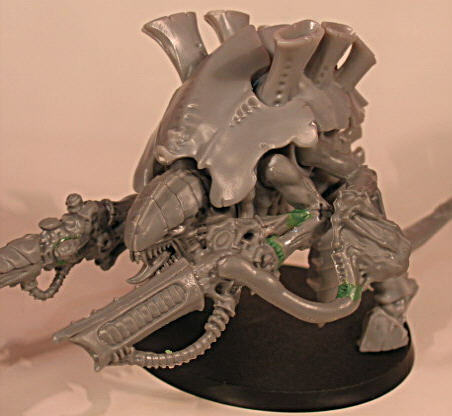 Most plastic figures come with Renedra bases and do not require weapon replacements. Army values include base and spear (for metal figures) but do not include shipping, currency conversion or unit/army discounts . I could keep going, but the trend is apparent. Metal figure armies run between $350 and $450 dollars. Plastic figure armies price in at less than $150! 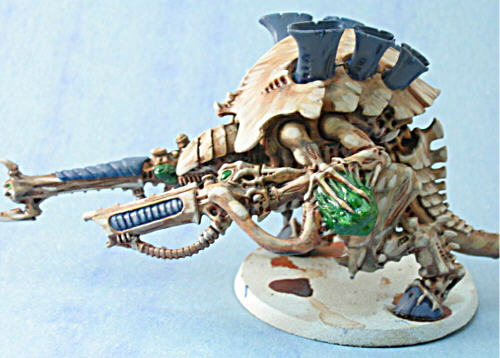 River City Hobbies, La Crosse WI is hosting a Warhammer Ancients tournament on August 13th. In a rare hobby appearance outside of Adepticon, I get to attend….which means I need to get working on a 1500 point list. First draft from the El Cid African Invaders army list. The list has a solid core of 3 strong spear unit, moderate shooting with 34 archers plus the crossbowmen and a hammer in the Knights. Over half of the army is made up of mercenary units and will be subject to a d6 check at the start of the game and will be unable to use the general’s leadership. One merc unit can become the general’s body guard and avoid these restrictions – the list was written to add the general to the knights, but I may instead put him on foot with the merc spearmen. This way the rock of my battle line can take advantage of both the general’s ld9 and the ASB re-roll. The list is also lacking any good way to chase off skirmishers which are common in the armies I normally face. At the next club night, I hope to take the list out for a test drive & see how it works. Comments and suggestions are welcome. On a related topic, GW has come out with their annual price increases along with announcing other assorted unpleasantness. 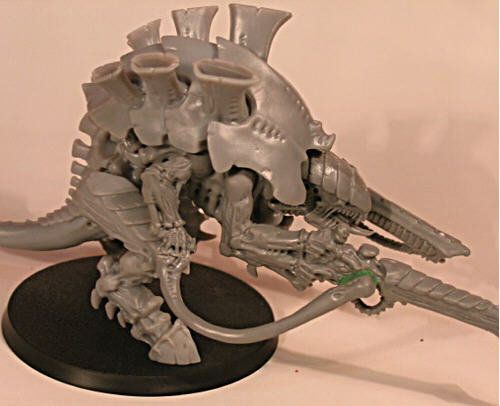 BOLS has a reasoned response with pricings for sample 40K, WFB and PP armies. I’m happy to say that my El Cid list with 106 figures comes in between $185 and $235 (depending on figure sources). These prices compare well with 40K and WFB in the $400 to $550 range, and even PP (and its handful of models) at $175 to $250. When a dozen gamers get together and all think a new product rocks (and hell has not frozen over) – its time to pay attention. 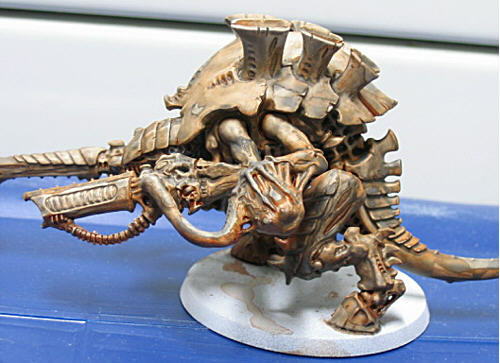 The new Citadel Washes received high praise over at Dakka – surprised by the response, I bought a box to try out the washes myself. 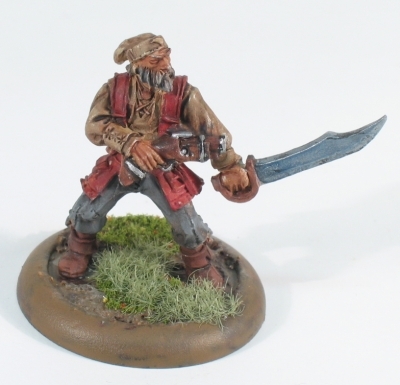 One of the problems with my painting style is a lack of shade – and washes are a perfect way of restoring the shade/mid range/highlight balance on a finished figure. 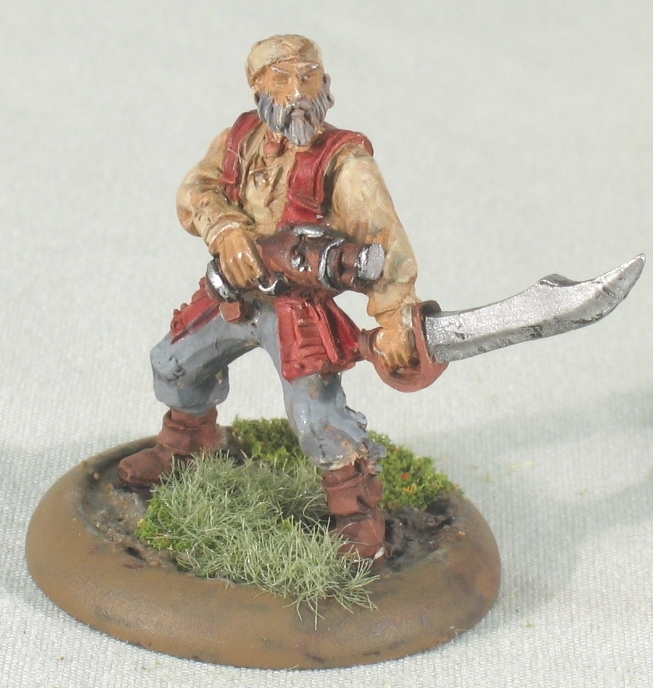 Below are washed (left) and unwashed (right) pictures of the same Pirate model. I was able to try out most of the washes provided in the box set: shirt- Devlan Mud, pants – Badab black, vest- Baal Red, skin – Ogryn Flesh, sword – Asurmen blue. I’m most impressed with Mud on the tan shirt. 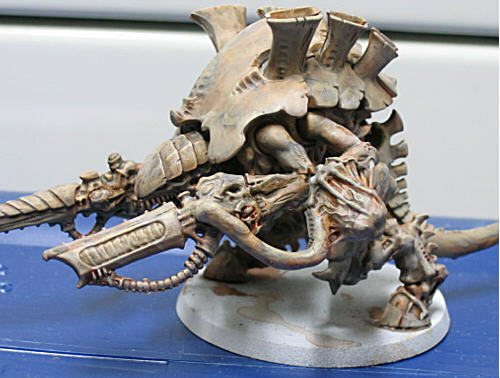 Ogryn Flesh is a lot like the old Flesh Wash. Baal Red did not do much on the vest – I really should give it another try using the Leviathan Purple instead. Asurmen blue on the sword is a bit much for a “historical” pirate – but I supect that a mix of black and blue has a lot of potential as an armor wash. 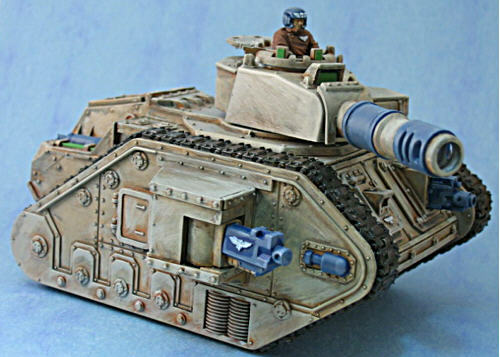 Hands down, the new plastic Baneblade is the best model kit GW has ever produced. I hope the fan boy is not roaring too loud here, but the model practically builds itself. The computer aided design is very evident in the precision and fit of the pieces. Joints and corners are very cleanly constructed with very small tolerances. The auxiliary weapons are cast with both more and finer detail that previous kits. And best of all, at $95.00 the Bane Blade is at a better price point than most of GW’s kits. Of course, I am still able to find one thing to complain about (this is the Internet after all) – the drive wheels on the front and rear of the tracks should be better connected to the tank hull. The rear wheel is very weakly attached to the side wall with a small pin & wrapping the caterpillar tracks around the wheel in a straight line was a “challenge”. 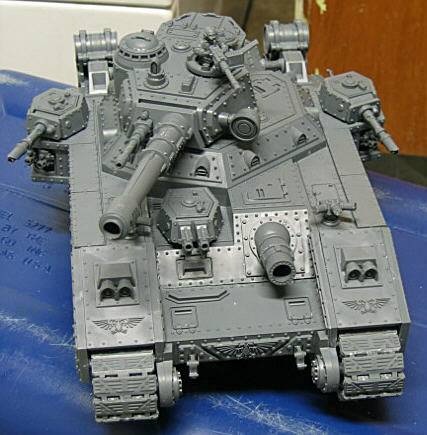 Additional comments on the Baneblade can be found at Work in Progress and Dakka Dakka. 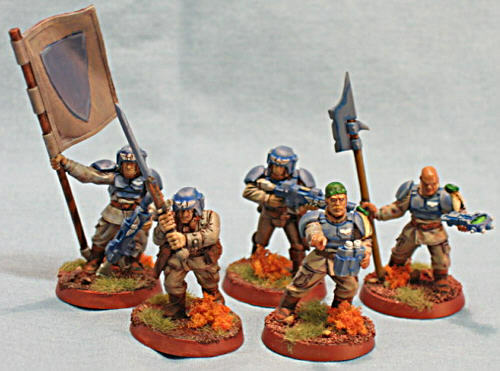 Imperial Guard army pics now up! Only took most of a year to get my army photographed, but the Imperial Guard army gallery is finally up. Say hello to Karl’s Crusaders. The 40K tournament that asks: does it matter who’s fighting next to you? Bill Evans, judge and organizer, has jammed all sorts of ticks into this event. First, armies must include a unit from a different army list – hence the Enemy of my Enemy title. Second, the scoring and prize categories are both plentiful and varied. I have my eye on the Fluffmeister Champion award that incorporates Army Appearance, Display Base, Army List and a few other things. As this event will be my annual opportunity to play a game of 40K, I don’t hold out much hope to rack up many battle points. Finally, Bill has added a Best Gaming Table award; bring in an entire table worth of gaming terrain! It’s June, why am I so pumped up about a tournament in October? Because it’s going to take four months to get everything ready. I’m back in school for the summer with a professor who believes assigning lots of paper is a good way of teaching the material, which puts me on hobby hiatus until August. Then its one short month until fall session starts. 1850 IG army: ready to go. I’d like to update the tanks, but they can go as is. 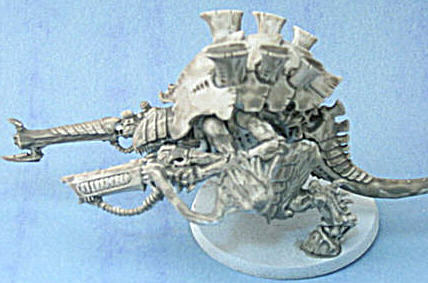 Enemy: Carnifex, converted with VC and BS – Stubby will step into fill the roll normally played by Leman Russ tank #2. Display Base: already roughed out the base in pink foam & started carving rune pieces. Might change a lot, don’t know if I’m satisfied with the runes yet. 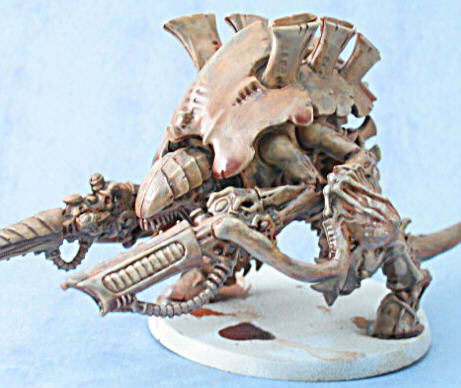 Army List: More than just good old Army Builder is needed for this. I have a good idea of the army fluff (in fact, it’s been on my About to do list for some time now), now it’s a matter of design. Game Table: Not sure if I’ll just pull most of a table out of the closet or start from scratch. The display base project and the game table could quickly become one in the same if I produce molds for most of the work. You are currently browsing the archives for the GW category.